It’s been on my to-do list now for well over a year but pregnancy meant that, in between having my head down a toilet and then losing the ability to make any proper decisions other than what pram I wanted, giving my little blog a revamp was been pushed way way back on my list of things to do. I’m not sure what entirely came over me or how on earth I found the time, but with a shed load of tea, some Elsie-sitters and my technical genius fairy, we managed to give the blog a little make-over and name tweak last week. I haven’t gone too crazy in terms of the revamp. I’ve just given it a fresher and cleaner look. At least that’s one area of my life I can keep clean seeing my home (and myself included) will never be as fresh and clean as it once was…swings and roundabouts and all that. 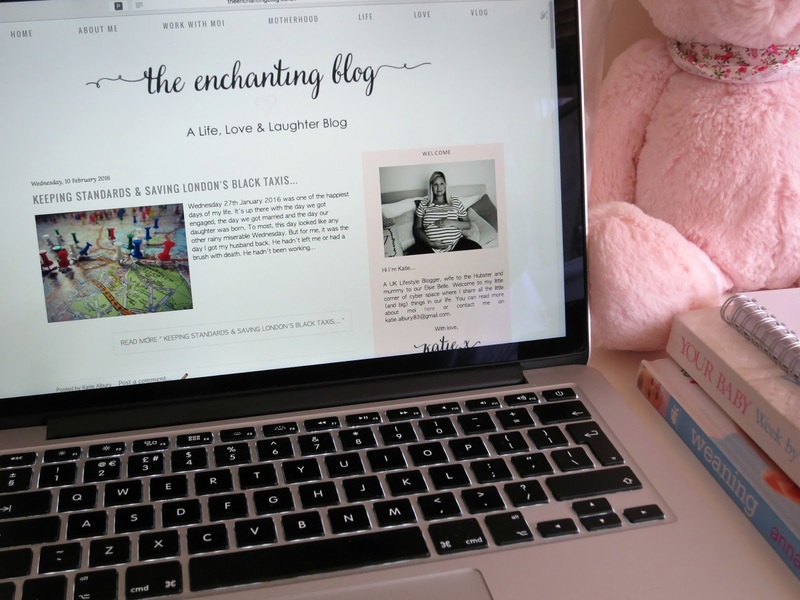 Of last week, my little corner of cyber space has been spruced up and renamed, “The Enchanting Blog“. Back in September 2013 when I launched ‘Miss Enchanting’ with this post, I was in an entirely different place in my life. I have no idea why I originally decided to call myself “Miss,” seeing as I hadn’t long been made a “Mrs,” but the ‘Enchanting‘ aspect is a little more special to me. It reminds me of a time when life was a little more peachy. That’s not to say that it isn’t now, but it’s just very different. Or should I say, I’m different. The old me of three years ago was always in a lovely bubble. A bubble full of optimism, control and positivity and as much as I try to keep hold of that person, since becoming a parent I see life through different eyes now. I suppose I’m holding on to a little piece of that carefree life through my blog. I’m not going to set myself any unrealistic schedules and plans. I’ve tried that once too many times before over the last year, setting targets too high which inevitably takes all the fun out of writing and creating content. If having a baby has taught me anything, it’s that no day is the same anymore and each and every moment is as unpredictable as the next. So I want to enjoy what I do again in the hope that you lovely lot will continue to do so too.